Many of you know that I have a bit of a lust affair with Askinosie chocolate. Not only do they make some of the most amazing chocolate, they do brilliant single origin cocoa powder, mini chocolate bars, peppermint bark, and hazelnut spread but they now do amazing flavoured bars name in collaboration with other excellent companies. This bar which I cannot stop eating is made with 60% Tenende, Tanzania Dark Chocolate and Malted Milk powder. It isn’t sweet though – it is creamy complex deliciousness. 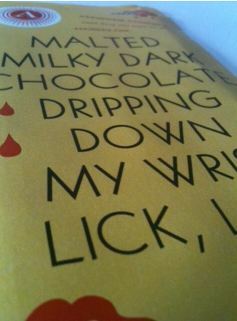 Askinosie vchocolate partnered with Jeni’s Splendid Ice Cream to create a dark chocololate and malted milk bar. 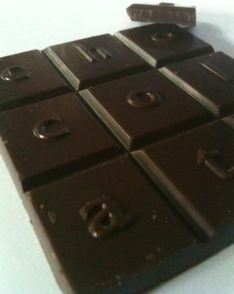 This bar is made with 60% cocoa and infused with malted milk powder. Though none of Jeni’s (absolutely Splendid!) ice cream made it into the bar, the malted milk represents the mutual appreciation for creating delightful eats from scratch of both Askinosie and Jeni’s. I cannot express how delicious this bar is in words. Perhaps the fact I let half the bar melt in my mouth one evening because I simply could not stop would help. I didn’t chew – I let it melt. This is a delightful, dark but slightly milky well-balanced bar. The flavours are not overwhelming and quite approachable., An excellent flavoured bar and one I hope others aspire to. Ha, ha. I think I might join you in that affair. I am posting my first review of Askinosie tomorrow! I KNOW there will be many more!